Casablanca - His Majesty King Mohammed VI chaired on Tuesday at the Royal Palace of Casablanca, a working session in the presence of the Head of Government and several ministers and senior officials to discuss the issue of immigration in the Kingdom with the view to devising a new comprehensive migration policy, said a statement from the King’s Office. 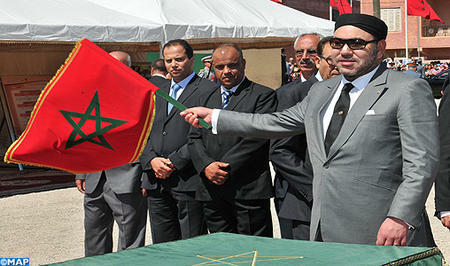 "On this occasion, His Majesty stressed that Morocco has become a host country for migrants. The number of immigrants from sub-Saharan African countries has quadrupled," the statement noted. "Morocco has also recently experienced, as a result of the global economic crisis, a new form of immigration from countries such as Spain, France and other European countries," the statement said, noting that "the Sovereign has reiterated the need to regularize the situation of people in terms of residence and the activities they perform, as well as legal immigrants of other nationalities, including sub-Saharan immigrants." Concerning the hosting conditions of legal immigrants, including their legal access to employment opportunities, decent living conditions and economic and social integration, the Kingdom of Morocco cannot accommodate all migrants wishing to settle there, the source said. However, the number of illegal immigrants is significantly increasing, mostly from the East and the South. In addition, certain groups of illegal migrants force their way into the Moroccan territory, which causes casualties among the police and migrants, the statement of the King’s Office added. "If the management of the issue of illegal immigration witnesses sometimes certain isolated abuses, there is no systematic use of violence by the police. Hence, Morocco denies all false claims that attempt to undermine its reputation," the statement said. "In this regard, the same source added, His Majesty the King had repeatedly given his instructions to the competent authorities to ensure the respect the rights of migrants, to comply strictly with the law in their treatment without discrimination, and to provide assistance to those wishing to return to their country, " adding that "the Sovereign also stressed the need to relentlessly pursue the fight against trafficking, and human trafficking networks." "During the same meeting, His Majesty the King gave his orders to the Government to immediately devise and implement a strategy and an appropriate action plan in coordination with the CNDH and the various stakeholders, with a view to devising a comprehensive policy on immigration," the statement noted. "The sovereign states that such a move will endow the Kingdom with the right tools to play a prominent and an active role in the regional and international scene in terms of migration management," the statement said, stressing that "the Royal Initiative, which is part of the deep welcoming traditions of the Kingdom, reflects the constant involvement of the sovereign for the protection of human rights in accordance with the provisions of the Constitution, the requirements of the rule of law, and in accordance with Morocco’s international commitments." The meeting takes place as CNDH publishes its report on the situation of migrants and refugees in Morocco. The working session was attended by Fouad Ali El Himma, Adviser to His Majesty the King, The Interior Minister, the Justice Minister, the Foreign Minister, The Minister delegate to the Minister of Interior, Mr. Fadel Benyaich, in charge mission at the Royal Cabinet, and the Secretary General of the Department of Employment.